The best Secret of NIMH fan art! The object of this group is to feature the best Secret of NIMH-related art on DA. 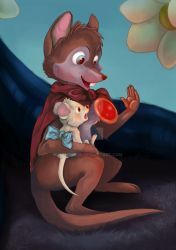 This group is dedicated to finding and sharing the best Secret of NIMH fanart on dA--emphasis on best. All art featured here is curated, and while beauty is in the eye of the beholder, submitted art should meet a minimum standard of technical skill to be accepted. See the "About us" link for more details. It looks like it's off to a decent start, though it's still a bit light on fan content. Even has some stuff for NIMH 2 if you're into that. When will the Thorn Valley Art gallery be finished with maintenance? There’s some pictures I wanna see and reprint like Megan Lucas’s work, stuff by Louise, Daniel Brown and maybe Marcus Linderman and Procyon. A friend of mine volunteered to take a look at extracting the data from the backup. I don't have a timeframe for when it'll be completed, but it's definitely something I hope will be done soonish. When will the old art site come back? I'm not entirely sure. Life's been keeping me busy, I'm afraid. I see, in that case, please take your time. Is the old art site gone? It says 404. I want to know if all the old art was saved. The VM it was on went down. I have a backup, but it'll take some time for me to get it restored. Cool. Because one artist I was always fond of, Asyra was her name? The one with the medical rat named clover? I like her. I still post stuff when it's submitted, but I haven't gone looking for fan art myself recently.